Gilera has revealed two new engines, which will provide the basis not only for future V-twin Gileras but Piaggios and Cagivas, too. They will power everything from scooters to superbikes. The two motors, which will be officially unveiled at the Milan show next month, share a conventional 90-degree V-angle and the same crankcase design – but unique cylinders and heads mean they promise to have totally different characters. They have been designed by Gilera’s parent company, Piaggio, at the firm’s base at Pontevera, near Pisa. The smaller, 850cc engine, a prototype of which is pictured here, is further advanced. The 1000cc motor, shown here at the computer design stage, will also be ready soon. To help cut the development time even further, the 850cc motor uses cylinders and heads based on the new, single-cylinder Piaggio X9 500 scooter engine that was launched this year. By sharing parts, Piaggio should be able not only to reduce the development time but also the production costs for the motor. Technically the 850cc engine doesn’t push any boundaries. 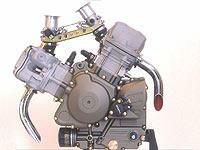 The heads from the X9 500 mean the motor has single overhead cams operating rockers to open four valves per cylinder. It’s bore has been reduced slightly, from the X9’s 92mm to 88mm – giving a capacity of 840cc – but otherwise the cylinders appear to be identical to the scooter. The stroke remains the same as the single at 69mm. Early tests suggest the most powerful version of the 850 motor, with Magneti Marelli fuel injection and 45mm throttle bodies, makes 80-85bhp. But, surprisingly, it’s the less powerful one that’s more interesting. Fitted with different injection featuring smaller, 38mm throttle bodies, it is electronically limited to just 50bhp – not an impressive figure for such a big engine. However, that’s more than enough for a scooter – which is just what it is destined for. Piaggio has developed a new variation on the continuously variable transmissions fitted to twist-and-go step-throughs which can cope with the grunt of the new motor – and as a result it plans to offer an amazing 850cc V-twin scooter next year. While most scooters have the engine and transmission built into one unit, so the engine itself moves with the suspension, the new Piaggio will feature a more conventional swingarm, with the engine mounted more like that of a bike. The firm also hopes to use the same engine and transmission to power a new concept of city-bike – which it hopes will challenge machines like Ducati’s Monster 600, which is incredibly popular with Italian commuters. While the bike will look, sound and handle like a conventional machine, it’s CVT gearbox means it will be as easy to ride as a scooter. And, just like an automatic car, it will be perfectly suited to the stop-start traffic in Italian cities. No clutch, no gears, just a throttle and brakes, which are likely to be linked so both front and rear operate from just one lever. The new 850cc scooter is expected to go on sale next year, while the city-bike could follow in 2003 if it gets the go-ahead from Piaggio bosses. In 2003, the more powerful 850cc motor is also expected to get its first outing – in a new Cagiva Raptor to replace the current Suzuki SV650-powered version. Although this has yet to be confirmed, Piaggio has just bought a 30 per cent stake in the MV Agusta group that owns the Cagiva brand – so cross-pollination between the firms is inevitable. As part of the deal, Piaggio is believed to have the option to take a controlling interest in MV in the next couple of years. If it takes that option, it will consolidate yet further its position as Europe’s biggest bike manufacturer – owning MV, Cagiva and Husqvarna as well as its current brands, which include Gilera, Vespa, Derbi and, of course, Piaggio. Although Piaggio’s new interest in MV Agusta means it now has a superbike at its disposal, in the form of the MV F4S, it still intends to build Gilera into a formidable name both on the road and the track. And that’s where the new 1000cc V-twin comes in. While the engine cases are similar to the cooking 850cc engine, the cylinders and heads certainly bear no relation to a scooter motor. The four valves per cylinder will be actuated by twin overhead camshafts rather than an SOHC system – optimising valve timing and lift and therefore increasing power. Early indications are that the 1000cc, fuel-injected motor will make around 120bhp as standard, and it should be possible to tune it further. If that’s not enough for you, the firm also has plans to stretch the 1000cc design to 1200cc – giving even more power. The 1000cc motor is set to be used in the forthcoming Gilera superbike. Along with its 850cc sister, it will also power a range of other street bikes featuring the Gilera name, as Piaggio intends to offer a wide range of Gilera-badged machines. A slightly de-tuned version of the 1000cc, DOHC motor is also expected to appear in the Cagiva Raptor – replacing the Suzuki TL1000-powered version of that bike. Piaggio will debut the engines alongside the new Gilera 600cc supersports bike at the Milan show next month. The first machines to feature the 850 engine are expected to be launched on 2002, while the 1000cc version will debut in a 2003 Gilera superbike.